Previously, in part two of this three part story arc (Adventures of Superman #8), Lois was informed that she would loose her family if she didn't help Lex Luthor win the White House. Meanwhile, Superman, after running into one of those nasty Boom Tubes, had awoken in one of Darkseid's prisons. Superman and fellow prisoner, Infinity Man, discuss the impenetrable fortress they find themselves in. It looks like there is no hope for escape, and Darkseid is on his way. But Superman doesn't have time for this. He doesn't have time for one of Darkseid's evil master plans. He's a superman on a mission. He has an appointment to keep. As Supes and Infinity Man discuss their plan of escape, Infinity Man tells Superman that he can see Earth's future. And if Superman doesn't get back and save one man, then the Earth will be thrown into another Dark Age that will, consequently, end all life on Earth. Oh goodie, another crisis to take care of. So, Superman finds a way out, saves a few people on Apokolips, throws down with some of Darkseid's minions and heads towards home. Back on Earth, Lois is decidedly unimpressed with Luthor's threats. She's wasted enough of her morning. She too has an appointment. Actually, she's bored with the whole conversation. Lex to Lois, "You are going to help get into the White House." Lois to Lex, "Hell no, I'm not." Lex to Lois, "Then, you will never see your family again." Lois to Lex, "Whatever." Yada, yada, yada. Same ole, same ole. Honestly, you'd think Lex would come up with something new. But as Lex confesses, he has 'failsafes for his failsafes.' And as Lois reaches the restaurant's exit, the audience sees the explosive that Lex has had placed on the door. If Lois opens it, she's dead. One has to wonder, did Lex really expect Lois to say, "Yes" to his plan? Probably not. He knew, that as a candidate for President, it would not be Superman who would be his greatest foe; it would be Lois Lane. That's why she must die. That's why he asked her to breakfast. He wanted to smugly tell her to her face that he would be President, and then make sure that there was nothing she could do about it. Superman hits the Earth's atmosphere. The atmospheric friction burns off Apokolips' stench. 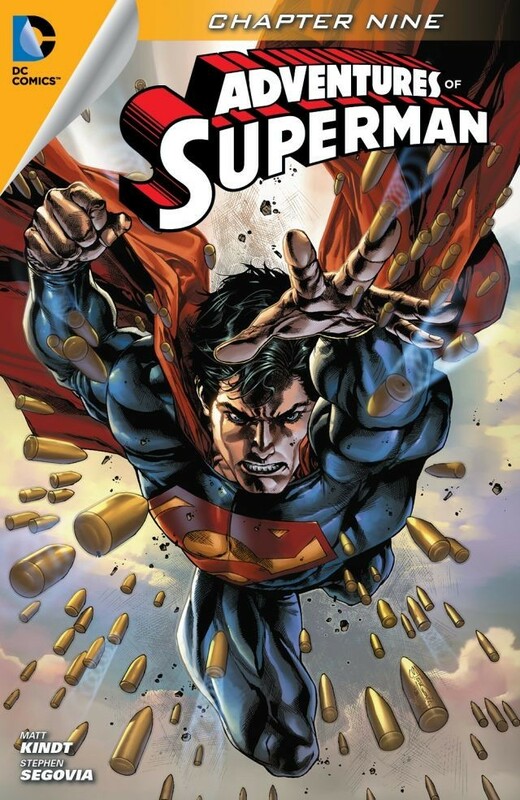 Supes then swoops down to Metropolis and saves the one man who's death can lead to Earth's demise. Then, Superman heads for home. But wait! One last thing to do... save Lois Lane. He quickly removes the explosives from the door, and we next see said explosives on Clark's bed. Gosh! I hope it's deactivated! Superman changes into Clark, and he makes his morning date with Lois. And it's a good thing they are both late. Story - 5: The Good: The story is excellent. Superman stories that show how his 'super' life and his 'human' life entwine are always interesting. When stories have too much of one over the other, I tend to get bored. As for those who are calling Superman to be 'relatable' (whatever the hell THAT means), what can be more relatable then having to hurry through an unexpectedly busy day to meet someone for coffee? Okay, sure, we don't battle giant worms or save all of humanity, but we do have to prioritize what is most important in our lives. When you get down to the nuts and bolts of this story, that's what Superman is doing. He can't do it all. He even says so in the story. So, he has to make choices. And he has to live with those choices. I also like that the story comes full-circle and brings us back to the question, "What does Clark dream about?" Some say that dreams are reflections of what you desire most. As a supersonic, flying alien, what could he possibly desire? He dreams about taking a slow walk. I like that about Clark. He does what needs to be done. But he also knows how to enjoy the simple pleasures of life. After flying from one galaxy to another, all he wants to do is to slow down and take a walk. As for Lois, she is right on in her repugnance of Luthor. He's not just bad, but boring. Her analytical mind needs to be challenged and Lex isn't even trying. As an avid Lois fan once said, "Lois is Lois." And she sure was in this issue. The Bad: I didn't find anything bad about the 'story' part of this issue. I would have liked to see Infinity Man come to Earth with Superman, but he probably stayed behind to help save people on Apokolips. Art - 4: The artwork on Supes story is bright and colorful and awesome. The one glimpse of Darkseid we get is scary and intimidating. However, the color palette in Lois and Lex's story line was too washed out. Lois looked pretty, but Lex looked, well, like a pansy. I mean pink and purple... really? He's not very intimidating. All in all, it was a great comic and a great series. 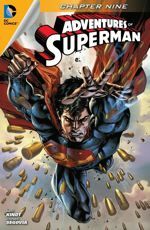 Check out the Comic Index Lists for the complete list of Superman-related comics published in 2013.